← Beauty Without The Blade Event at Bare Escentuals! Christopher’s skin is literally falling off his face! He’s aged dramatically over the past few years, and it’s time for him to do something about it. See those jowls and that turkey skin on his neck? A face and neck lift could make those a thing of the past! He could literally look 10-15 years younger with a procedure that takes about 3 hours and leaves him with a nearly invisible scar hidden around the ear. Christopher is a prime example of volume loss in the face that happens to all of us when we age. He’s lost it to the extreme, which is bad a bad thing right now because he looks like a cadaver, but it’s a good thing because it’s easy to fix! We could easily liposuction some extra fat from his abdomen and inject it into the intense looking cheek hollows, into the those deep lines next to his chin and around his mouth, into his non-existent lips, and into the deep hollows under his eyes. He would look like a new man! No question about it. Plus, the stem cells in the fat have been know to have positive long-term effects on the overlying skin by making it appear younger over the first year after injection. Since Chris is a pretty thin dude, there’s a chance that we might not be able to find enough fat on him to replace the fat he lost in the face, so we would have to resort to fillers as an alternative. A combination of Sculptra and Juvederm would work wonders in this situation. Tilda doesn’t need a full facelift. Most of her skin is still holding up where it should be. What she could use is a “mini” facelift to stop those jowls that are just starting to appear, and get rid of those awful neck lines she has under her chin. A mini-facelift has a smaller scar around the ear (which is inconsequential since the scar from a regular facelift heals almost invisibly if done correctly), and a slightly shorter recovery time. 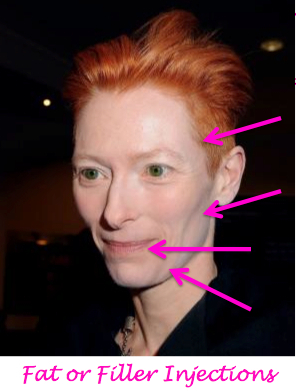 Tilda needs her facial volume restored almost as much as Chris. Facial volume is even more important in women since it keeps them from looking like… well, men! There’s no question that Tilda is looking a little boy’ish in this picture. She doesn’t have the classic youthful heart-shaped face that we all admire in our teens, 20’s and 30’s, but this could easily be remedied with fat injections to her cheek and temple hollows, and also to her paper thin lips. Fillers might play a key role for Tilda since there’s probably not an ounce of fat on her body that we could use for her face! It would be preferable to use fat if possible for it’s anti-aging effects on the skin we talked about above, but if she doesn’t have any, we’re pretty SOL 🙂 Thankfully, we have wonderful fillers like Sculptra and Juvederm that would work perfectly to fill those cheek and temple hollows that are keeping her from looking like a prettier, younger, girlier version of herself. Getting Old is the PITTS! How to use Radiesse to restore youthful cheeks!